What is the Firmament of Day 2? Updated Jan 28, 2019: This topic of the "firmament" is also of great interest to atheists. A popular anti-creationist made a 40-minute YouTube video critical of this article. We may have hit a nerve. Many atheists have claimed that the Bible teaches that the earth is surrounded by a solid domed sky. 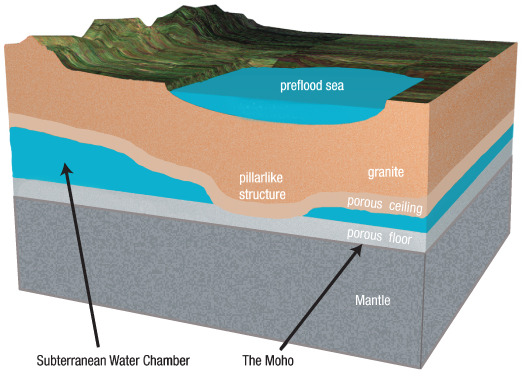 Instead, the Bible actually teaches that the firmament of Day Two is the crust of the earth, which divided water below the crust, from the waters on the surface. Documenting this thereby rebuts the widespread false allegation of a dome. When we first published this article, that extra bonus was unexpected. So we've embedded and responded to Brett Palmer's video including by pointing out that the Babylonian creation epic, Enuma Elish, below, corroborates this understanding of the "firmament" as first referring to the earth's crust (i.e., biblically, to paradise, to heaven on earth). And we show that the Bible's Hebrew word for firmament, raqia, from the verb raqa, refers not only to the heavens above, but explicitly, to the crust of the earth. And we present the meaning of the Syrian geographical place name, Raqqa, and extend to antiquity the etymology of the English word, rock. At Real Science Radio (which airs on Colorado's most-powerful radio station), we teach Dr. Walt Brown's Hydroplate Theory as the best understanding of the global flood, geology and the relevant scriptures. - "by the word of God the heavens were of old, and the earth [was] standing out of water and in the water" (2 Peter 3:5). "The earth is the Lord’s... For He has founded it upon the seas, and established it upon the waters" (Ps.24:1-2). Where the Water Came From: The global flood then began when those "fountains of the great deep were broken up" (Gen. 7:11) for the pre-flood earth had been "standing out of water and in the water, by which the world that then existed perished, being flooded with water" (2 Peter 3:5-6). Those waters had been stored up for global judgment if needed. For when "the heavens were made," the Bible says of much of the Earth's water back then that God "lays up the deep in storehouses" (Ps. 33:6-7; see also Prov. 8:27-28). For God created not only the surface waters, for He "made heaven, and earth, and the sea, and the fountains of waters" (Rev. 14:7 KJV [as with many versions; some like the NKJV say "springs of water"). Dr. Brown's book, In the Beginning, demonstrates powerfully that the world's major geologic features flow logically from these initial conditions. But some creationists who disagree point out that, "God called the firmament Heaven" (Gen. 1:8), claiming that this firmament must be either the atmosphere (e.g., Henry Morris) or outer space (e.g., Russell Humphreys). Heaven on Earth, Hell Beneath: However at RSR we show that, whether figurative or literal, the crust of the earth is the boundary between heaven and hell. It is consistent with the Bible story that God would originally call the crust of the earth "heaven." For at creation, "He drew a circular horizon on the face of the waters, at the boundary of light and darkness. The pillars of heaven tremble... He stirs up the sea with His power..." (Job 26:10-12). Everything below the crust can be referred to as hell, the place of the dead which functions as the prison that God had planned for any future unrepentant beings. "Hell from beneath is excited about you, to meet you at your coming" (Isa. 14:9; etc., and Abraham's bosom notwithstanding). For the newly-made earth, the Lord logically referred to everything from the crust and above as heaven. Hence dozens of verses indicate that heaven also refers to the earth's atmosphere as in "rain from heaven," the "dew of heaven," "birds of heaven," "dust from the heaven," city walls "fortified up to heaven," smoke rises "to the midst of heaven," "the heavens are shut" in drought, "frost of heaven," "clouds of heaven," "snow from heaven," "hail from heaven," and the east winds "blow in the heavens." Thus even after the Fall, from Genesis and Job, through the Gospels, Acts and Revelation, the Bible continued to refer to the atmosphere, one molecule above the ground, as heaven. Also, the Bible's thirty-two occurrences of the phrase "kingdom of heaven" appear only in the royal Gospel of Matthew, and some of these (Mat. 11:12; 13:24 with Mat. 13:38; 16:19; Mat. 18:1 with Luke 9:46; etc.) locate this kingdom of "heaven" at least partially on earth. Lucifer Fell from Heaven on Earth: "God called the firmament Heaven," because the earth's crust formed the boundary between heaven and the future hell. The firmament also divided the waters of the earth (Gen. 1:2, 6) which even reserved the floodwaters of judgment below ground. For God "lays up the deep in storehouses" so "let all the earth fear the Lord," (Ps. 33:7-8), because He "shut in the sea with doors" until in the flood "it burst forth and issued from the womb," (Job. 38:8). But after the Fall, which likely occurred within a week of Creation, earth lost its heavenly designation, for apparently God will never fully replicate the first earth. Only two detailed Bible stories involve happenings that occured prior to the Fall, the creation account and the record of Lucifer's fall. And both of these events refer to earth as heaven. 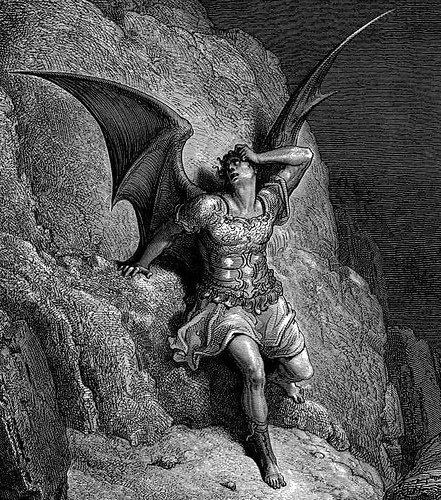 Isaiah 14:12 describes "Lucifer" as "fallen from heaven," yet Scripture places him on earth at the moment of his fall. "You were in Eden, the garden of God," (Ezek. 28:13). And "you have said in your heart: "I will ascend into heaven... I will ascend above the heights of the clouds," (Isa. 14:13-14). "Yet you shall be brought down to Sheol, to the lowest depths of the Pit," (Isa. 14:15). Even though he was on earth, Lucifer fell "from heaven," because prior to the Fall, the surface of the earth was part of heaven's realm. Consider the flesh. Notice that just as gravity pulls our physical flesh down toward the center of the earth, the Fall created the world system which relentlessly pulls our spiritual flesh, drawing us down toward the lowest depths until death, and then the believer's released spirit soars upward to heaven, whereas the unbeliever's unfettered spirit falls downward, the firmament no longer keeping him out of Hades, thus his soul plummets into hell. C.S. Lewis wrote the preface to D.E. Harding's esoteric The Hierarchy of Heaven & Earth in which Harding wrote that "Hierarchy is... something like the ancient circles of heaven and earth and hell" (1952, p. 27), and that the "narrowest Hell would be widest Heaven if the Devil could only bring himself to turn round and look out from the Centre instead of in at himself" (p. 187). In the modern classic, Soul of Science, (1994, p. 38), Pearcey and Thaxton describe the view of Christian "medieval cosmology" that "at the very center of the universe was Hell, then the earth, then (moving outward from the center) the progressively nobler spheres of the heavens." Christians continue to affirm this hierarchy quoting Paul who was "caught up to the third heaven" (2 Cor 12:2), the first being the sky, the second is space, and the third God's habitation. King David even refers to the deep, as the "channels of the sea", where in the flood "the foundations of the world were uncovered", which were "the foundations of heaven" (2 Sam. 22:8, 16). Moses Qualified His Last Four Uses of Firmament: Moses used the word firmament nine times in the creation account. He intentionally distinguished the last four occurrences from the first four, all of which pivot around the central instance where God called the earth's firmament Heaven. Each of the four in the second grouping (Genesis 1:14, 15, 17, 20) is qualified separately by an exceptional repetition. The prepositional phrase "of the heavens" makes a distinction between the first firmament of the earth, and the second "firmament of the heavens." And if firmament means the "heavens," the very term "firmament of the heavens" would seem unnecessarily redundant. However, the qualifier "of the heavens" is added so that the reader will not confuse this firmament of sky and space with the previous firmament of earth. Thus, readers alien to the notion of "heaven" on earth should nonetheless be able to separate the two firmaments, and understand God's meaning. Now, millennia after the Fall, God's own record of creation notwithstanding, sin has almost completely obscured the original perspective of the earth's surface as "heaven." Kingdom of Heaven Lost on Earth: When man rebelled, earth became more like hell than heaven. Thus man's habitation on the surface of the earth lost its heavenly designation. The Bible describes Hell as below, bounded by the firmament. However in the beginning "God called the firmament Heaven" because that's where He placed Adam and Eve, above ground on the surface, in the heavens, in fellowship with Him, not in any other realm but in His kingdom, in heaven on earth. 2011 UPDATE - Atheists and the Solid Dome: YouTube anti-creationist Brett Palmer created a 40-minute rebuttal video (embedded here) of this little article on the firmament. Seems like we hit a nerve. Aside from Brett casting aspersions from the recently invented flat-earth myth, consider that as with many other atheists, he claims that the word firmament (Hebrew raqia) discredits the creation account by showing that Genesis cannot be God's Word because it merely echoes the ancient world's false belief in a solid domed sky above the earth. So, if raqia (firmament) refers not only to the heavens, but also to the crust of the earth, standing above a subterranean chamber of water, then atheists would lose a favorite argument. Raqia is the noun from the verb raqa meaning being hammered or spread out, as in working metal into a thin sheet or plate. "They beat (raqa) the gold into thin sheets" (Exodus 39:3). "The goldsmith overspreads (raqa) it with gold" (Isaiah 40:19; i.e., gold-plated). Similarly, God overspread the waters of the earth with the plates of the earth's crust, i.e., the firmament, what Walt Brown calls hydroplates. For "God made the firmament (raqia), and divided the waters which were under the firmament (raqia, the crustal plates) from the waters which were above the firmament" (Genesis 1:7). When the Bible specifically links raqa to the earth (as in the passages below), and because words typically have multiple meanings, it is extreme to insist that raqia cannot refer to anything but the heavens. Genesis was written back when pagans wondered what held up the earth. Perhaps it rested on the back of a tortoise, or on a pillar, or was held up by Atlas. Yet the most ancient Scripture teaches that God, "hangs the earth on nothing" (Job 26:7), which is visually consistent with modern astronomical observation. For just as the firmament of the earth holds up the mountains, so too, the firmament "of the heavens" is strong enough to hold the earth. The firmament (raqia) of the creation account was iconic in ancient Israel, as the Tyndale Bible Dictionary says, "the firmament is always related to Creation." So the repetition and by two authors shows that the wording is deliberate. Thus these verses show an ancient awareness in Scripture that God raqa the Earth, that is, that His stretching out of the raqia of Genesis 1:8 readily refers to terra firma, or as the King James translators coined the word from the Latin, the firmament. of heaven suffers violence, and the violent take it by force." good seed in his field;" and "the field is the world..."
whatever you loose on earth will be loosed in heaven"
Pillars of Heaven: Regarding the crust of the Earth being referred to as heaven, consider the "pillars" which formed beneath the crust, as Dr. Brown describes it, at many "locations, the [subterranean] chamber’s sagging ceiling pressed against the chamber’s floor. These solid contacts will be called pillars." Thus since they supported the Earth's surface, they could be referred to as "pillars of heaven", just beneath the surface, which would "tremble" when they were crushed in God's judgment of the great flood of Noah's day, When God, "stirs up the sea with His power", as Job put it. "He drew a circular horizon on the face of the waters, at the boundary of light and darkness. The pillars of heaven tremble... He stirs up the sea with His power..." (Job 26:10-12). * Not Half Bad and Not Half Right: Hey, for Google, that's not half bad, for the firmament (the Earth's surface) was called heaven so that Adam and Eve could be fruitful and multiply and fill the Kingdom of Heaven on Earth. Then regarding Palmer's claim that, "no one before or since Enyart has ever asserted that two firmaments were created," Dr. Brown's book credits "two pastors" with showing him this simple heaven-on-earth understanding of Genesis 1:8. The pastor before me later publishing a book on the topic: Paradise: Past, Present, and Future, and of course since then, Walt Brown too has adopted this understanding. * Babylonian Creation Epic: The ancient pagan world had a corrupted memory of biblical accounts. Compare for example Egypt's sun god arising out of the waters of creation with, "God moved upon the face of the waters. And God said, 'Let there be light.'" Likewise the flood of Noah's day is remembered in Babylon's Epic of Gilgamesh. Also, the seven tablets of Enuma Elish similarities to the seven days of the creation week include man's creation on the sixth day which is presented on the sixth tablet. The first creation tablet describes the "waters commingling as a single body" when "no marsh land had [yet] appeared", reminiscent of the firmament dividing the waters (Gen. 1:6-7) and the dry land appearing (Gen. 1:9). The truth reported by Moses in Genesis 1:8a, that God called the firmament heaven (referring to the crust of the Earth, i.e., God's kingdom of heaven, on Earth) is emphasized in the first lines of the first Babylonian creation tablet which state, "When on high the heaven had not been named, Firm ground below had not been called by that name." That is, before the term "heaven" even applied to sky and space, before that not even the firmament below had yet been called that same name, i.e., heaven. (This translation, "firm ground below had not [yet] been called by that name", appears in old-earth Oxford Prof. John Lennox' book Seven Days that Divide the World. Importantly, after discussing this matter personally with Dr. Lennox, RSR can report that he does not agree with our Genesis 1:8 interpretation, so in no way would he publish a biased translation to make our point.) For as Moses wrote, "God made the firmament, and divided the waters which were under the firmament from the waters which were above the firmament... And God called the firmament Heaven... Then God said, '...let the dry land appear.'" So whereas atheist video maker Palmer (see above) says that "no one before or since Enyart has ever asserted that two firmaments were created in the creation story", Brett can now consider that this Babylonian Enuma Elish creation epic parallels the Hydroplate Theory's understanding of the firmament as referring also, and originally, to the "firm ground below" the heavens. 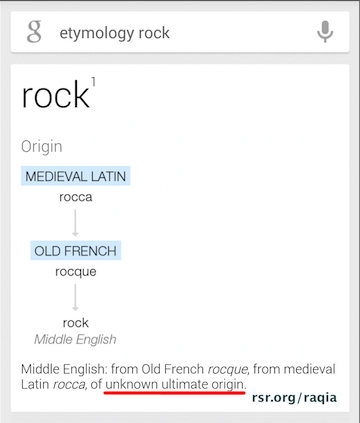 And thus, because God raqa the Earth, by creating the raqia, that is, the solid rock crust of the Earth, therefore, the etymology of the English word rock can now be traced back much further than the medieval Latin rocca. Not surprisingly then, studying geography we find that root word in the names of various ancient places in the region. For example, in 2015 Raqqa hit the headlines as the capital city of the Islamic terrorist group ISIS. An accurate understanding of Genesis is essential for understanding early history. Thus we can now trace the etymology of our English word rock to that very Epic of Gilgamesh flood account, with Gilgamesh being the king of Uruk, located in the south of the modern nation with a name that means "deeply rooted, well-watered", for God placed the water deep under the raqia which explains the name of the ancient place, Iraq. * Countries, Regions, and Peoples Ending in A and IA: Why do so many place names end in ia? God raqa the raqia to give mankind a place to live on the face of the Earth. In the web's most complete list of place names that end in ia, see about 120 significant geographical regions that end with -a or -ia, and others that sound like they end in ia, like Kenya and Libya. (RSR maintains this list.) Consider also, not unlike the city of Raqqa and the country of Iraq, the continent of Africa may have a related etymology, and consider also that in Arabic afar means dust, earth. And the names of many lands that do not end in -ia, as Egypt, still give a nod to the suffix when referencing their people, as with Egyptian, Akkadian, Persian, and the more modern Caucasian, with -ian equating also to the -yan as discussed at rsr.org/yan such as Aryan (meaning from the Sun land). * Seven-Day Week: The worldwide use of a seven-day week results from the creation account. And those seven days are named for the heavenly bodies (Saturn, Sun, Moon, etc.) as God said, "Let there be lights in the firmament of the heavens to divide the day from the night, and let them be for signs and for seasons, and for days and years." (On a related topic we interviewed Scientific American editor and atheist Michael Shermer for Real Science Radio. That full show is so much fun to listen to.) "Dr. Shermer, while much of the ancient world was worshiping heavenly bodies, could you at least agree that the Bible is correct on page one, where it states that the Sun is a light?" [Moses was correct also when he taught in Deuteronomy that the planets and stars are not gods and should not be worshiped.] "So can you agree that the Bible is correct in Genesis chapter one, that the Sun is not a god, but a light?" To which Shermer infamously replied, which you can hear in this 73-second excerpt (and transcript) that the sun is not a light. Wow. It's often difficult to have a reasonable discussion with atheists. Also, the worldwide use of blood sacrifices resulted from God commanding Adam and Noah to sacrifice animals prefiguring the sacrifice of Jesus Christ, the Lamb of God. * A Solid Dome Sky Belief Widespread Yet Not Intuitive: As Wikipedia reports, "The notion of the sky as a solid object (rather than just an atmospheric expanse) was widespread among both ancient civilizations and primitive cultures, including ancient Greece, Egypt, China, India, native Americans, Australian Aborigines, and also early Christians. It is probably a universal human trait to perceive the sky as a solid dome." Retrieved 8-27-11. However, with the many varied movements in the heavens of the Sun, Moon, planets, stars, comets, and meteorites, it's not intuitive that so much of the whole world would end up believing that the Earth had a solid-domed sky. Except, of course, if the ancients who populated the world after the global flood were misunderstanding the raqia of Day Two as referring to the heavens instead of to the crust of the earth. Conclusion: So, the Bible speaks of Earth using the same term, raqia, as for the firmament "of the heavens" (clarified that way in Genesis 1). Yet when the paradise of Eden and God's Kingdom of Heaven on Earth became "filled with violence," mankind began to forget that God made earth as part of His Kingdom of heaven. Thus, what changed was the common use of the term heaven for the Earth. Email: From Walt Brown to Bob Enyart on March 22, 2005: "Dear Bob, I like your proposal concerning Genesis 1:8a, and after much thought, have decided to include it [in the 8th edition of In the Beginning]. I have credited Pastor Diego Rodriguez and you as the originators of this very attractive explanation. ... Thank you for sending me your explanation. -Walt"
Bob became a believer in 1973, entered full-time Christian work in 1989, and in 1991 began hosting a daily show on America's most powerful Christian radio station, the 50,000-watt AM 670 KLTT. In 1999, the elders and pastor of Denver's Derby Bible Church ordained Bob into the ministry. In 2000, Derby planted Denver Bible Church with Bob as pastor and in 2015 as a host of Real Science Radio Bob was inducted into the Creation Science Hall of Fame. You can see Bob Enyart's materials online or call 1-800-8Enyart for a catalog. If you enjoyed this article, you may also want to read Why Canaan was Cursed?, Polygamy in the Bible, and Slavery in the Bible. And you can hear Bob at RealScienceRadio.com!